Paddy Nyunkuny Bedford was born at Bedford Downs Station, a large cattle property in the remote East Kimberley of Western Australia. He belonged to the Gija people. His family history was marked by several brutal events resulting from clashes between white colonists and his indigenous ancestors. He worked as a stockman around Warnum in the East Kimberley until precluded by injury. As a senior law man of his tribe, who determined proper customs and traditions, Paddy had engaged in traditional painting for ceremonial purposes, especially body-painting, from early manhood. 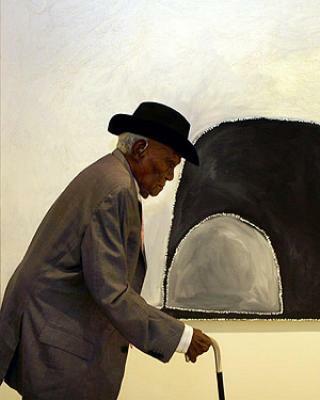 It was only much later in life, in 1998, that he was encouraged to paint on canvas and later in gouache on paper. He soon joined the newly formed Jirrawun Arts group and became part of the East Kimberley/Turkey Creek movement led by Rover Thomas and Queenie McKenzie. Solo exhibitions in Melbourne, Sydney, Canberra and Darwin soon drew the praise of art critics and his work was recognized as groundbreaking. In a short period of eight years Bedford built up a rich oeuvre and was to be regarded as one of the most important indigenous artists of Australia. His work has a unique distinctive style: very graphical, use of striking colors, and sparse but precisely placed lines, often delineated by white dots. His works depict the East Kimberley landscape where he lived and worked his whole life, in combination with the Dreamtime stories of the emu, turkey and black cockatoo associated with his family. Also featured in his work are historical events, such as the Bedford Downs Massacre - the brutal murder of a group of family members in the early 20th century in retaliation for killing a bullock. Yet, central to his work is reconciliation, referred to as “two-way”. Paddy Bedford was one of eight Australian indigenous artists commissioned to deliver a permanent work for the Musée du Quai Branly in Paris, for its opening in 2006. His work was honored later that year with a major retrospective at the Museum of Contemporary Art in Sydney that went on a national tour. An extraordinary achievement for an octogenarian, who only began his career as an artist less than a decade earlier. Since his death in 2007, his reputation has increased. In 2013 the Australian Airline, Qantas, commissioned the external livery of a new Boeing 737-800 to reflect his work Medicine Pocket (2005). Moreover, his works are exhibited in Australia’s major public galleries, as well as in private collections worldwide. 2015: No Boundaries: Aboriginal Australian Contemporary Abstract Painting, Perez Art Museum, Miami, USA. 2006-2007: Paddy Bedford, Museum of Contemporary Art, Sydney, Australia 2003: Art Gallery of New South Wales, Sydney.